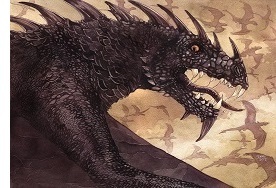 Ancalagon the Black - The great dragon of Morgoth at the end of the First Age. Ancalagon led a host of dragons against the Valar in the War of Wrath. He was eventually slain by Eärendil. "Then, seeing that his hosts were overthrown and his power dispersed, Morgoth quailed, and he dared not come forth himself. But he loosed upon his foes the last desperate assault that he had prepared, and out of the pits of Angband there issued the winged dragons, that had not before been seen; and so sudden and ruinous was the onset of that dreadful fleet that the host of the Valar was driven back, for the coming of the dragons was with great thunder, and lightning, and a tempest of fire.